Beans are a delicious vegetarian source or protein, and they're so versatile as a main course or side dish. These three vegetarian bean recipes can add variety to your meals. This recipe simmers on the stovetop, filling your kitchen with a spicy aroma. These beans have a lovely balance of a little bit of sweet, a little bit of heat, and a slight smokiness. The recipe serves six. In a large pot, heat the olive oil on medium-high heat until it shimmers. Add the onion and green pepper and cook, stirring occasionally, until the vegetables start to brown, about seven minutes. Add the garlic cloves. Cook, stirring constantly until the garlic is fragrant, about 30 seconds. Add the tomato paste and cook, stirring constantly, until it starts to brown, about two minutes more. Add the tomato sauce, scraping any browned bits from the bottom of the pan with the side of a spoon. Add the navy beans, molasses, liquid smoke, paprika, chili powder, chipotle chili powder, mustard, and salt. Bring to a simmer, stirring constantly. Reduce the heat to medium-low. Simmer for 20 minutes, stirring frequently. This recipe makes a whole mess of beans. It's great for a large group, such as a potluck or barbecue. For smaller groups, reduce the recipe size or freeze the beans in a tightly sealed container for up to one year. Use a six-quart slow cooker. The recipe serves 12. In a food processor, combine the garlic, jalapeno peppers, Anaheim pepper, red bell pepper, and green bell pepper. Pulse for ten one-second pulses. Add the mixture to the slow cooker with the onion, pinto beans, kidney beans, barbecue sauce, Dijon mustard, syrup, bourbon, salt, pepper, and cayenne. Cover and cook on low for eight hours or on high for four hours. This recipe is a bit of a departure from traditional baked beans, but it's really delicious. 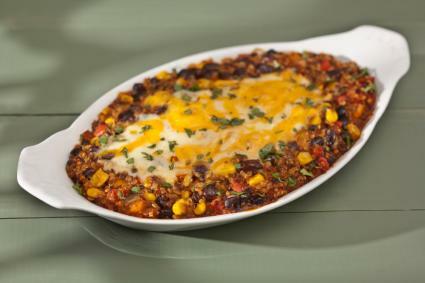 It uses black beans, corn, and traditional Mexican flavor profiles. It uses cheese, but vegans can leave the cheese off or they can substitute vegan cheese for a tasty dairy-free dish. For a variation, stir in one cup of cooked quinoa before baking the beans. The recipe serves six. In a large saute pan, heat the olive oil on medium-high until it shimmers. Add the onion, jalapeno, and red bell pepper. Cook, stirring frequently, until the vegetables are soft, about five minutes. Add the black beans, corn, tomato sauce, chipotle chili powder, cumin, garlic powder, coriander, salt, and cayenne. Bring to a simmer. Pour into a 9x13-inch baking dish. Sprinkle the cheese over the top (optional). Sprinkle with the cilantro before serving. 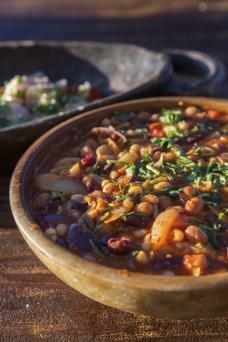 Beans are a tasty vegetarian source of protein. With their neutral flavor, they are practically a blank slate for any seasonings you'd like to add. 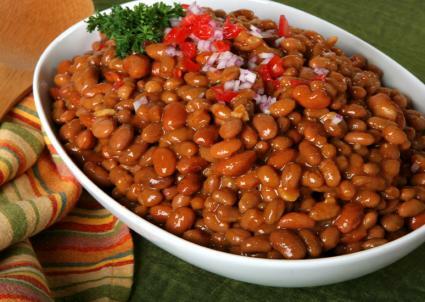 Try these recipes or variations of your own to make delicious bean dishes.